My old-fashioned snowball bush is gorgeous right now. The huge flower clusters, which start out as green, have now turned almost pure white, and the entire bush is heavy and drooping with them. There must be hundreds and hundreds of blooms, and each individual cluster gets larger and whiter as they mature. I have had this shrub for many years and it is huge, more than 15 feet tall and still growing. I don’t ever do anything to it other than pruning it a bit right after it finishes blooming. I also keep the trunks clear of branches from the ground up to a little more than 5 feet, and pruning it this way keeps it like a standard or small tree with a large canopy instead of a shrub. I can easily stand underneath it. In late evening and even at night, the white flowers are phosphorescent and practically glow in the dark. The photo at left was taken at twilight (click to enlarge). Snowballs would be great for a moon garden. This shrub blooms for many weeks in the spring and when the petals start falling, they look like snow on the grass underneath it. I always look forward to seeing this large shrub bloom every year. The one drawback to this shrub that I have found is that when it is at peak bloom and the flower clusters are at their largest, heavy rains can be damaging to the flowers and can cause the branches to become so heavy that they droop almost to the ground. This shrub is at the edge of my yard and is visible from the road — I’ve had many people stop and ask about it or want to take photos of it when it’s in full bloom. I have successfully propagated this deciduous shrub for others by rooting semi-hardwood and hardwood cuttings from it in the early summer. I simply take several cuttings of about 12 inches long, remove most of the leaves, and place them about 5 inches deep in a rich, sandy potting mix I have in a deep old tub at the edge of the woods. The tub gets dappled sunlight, and I do keep it watered through the summer months. By the following spring and summer, usually more than half of the cuttings are well-rooted and ready to transplant. I’ve had good luck propagating many flowers, shrubs, and even trees this way. That’s seems to be a very beautiful flower. Hi Quintarantino, It has a very light scent when it first starts blooming that reminds me kinda of carnations, but now that the blooms have turned white, I can’t smell anything. It is a beautiful flower though, I just love it. I think it looks stunning, the blooms are awesome. Hi Tom, I’ve always loved this shrub, especially when the blooms turn white. Thank you for stopping by. Seeing these beauties brings back memories to my grandmother’s yard. Love the twilight shot of yours–the main reason I like white flowers so much. You can’t miss them! Thanks, nonizamboni! I too love the way white flowers seem to glow. Hi! What’s in a “sandy potting mix” ? Is it ok to put the pot with the cutting in temps. around 50 degrees? Good luck with your cuttings. 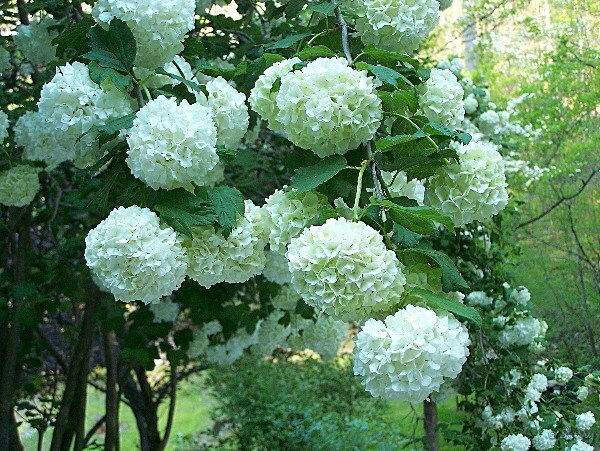 I have read about these snowballs on many websites as I just bought 30 of them for a hedge. One site brought up this same none flowering issue and they finally tried fertilizing it in the spring and after 15 years it finally started booming who knew chicken manure was so awesome was what they said. I hope this helps and I hope mine do as well as these wonderful pictures as I live in zone 3-4 in Anchorage Alaska. I live in DeLand, FL which is inland from Daytona, zone 9. I have a 2 year old snowball that has finaaly bloomed, but it’s October and the blooms are fgot along the top but further down the sides??? I used a systemic fertilizer-pesticide-fungicide on it this spring and it shot up 3 feet after basically no growth the last two years. The fungicide really helps control the leaf browning and curling. I hate using chemical controls, but I think I’m pushing the limit on plant zone tolerance here, so it needs the help. I would think that after 5 yrs, yours should have bloomed by now, and I’m not sure why it hasn’t. Mine is in full sun all day.. but I would think yours would have at least a few blooms even if it isn’t getting -enough- sun. Have you pruned it? The only time they should be pruned is right after flowering is finished, usually around the last of May/first of June, since they set flower buds during the summer for the following spring’s bloom. Do other people grow them in your area? I’m sorry I can’t be of more help, I just can’t think of any reason why yours hasn’t bloomed by now (unless you are pruning off the buds?). It is gorgeous shrub even without the blooms. Mine doesn’t bloom either. Too much shade I think. You’re probably right in that it gets too much shade, or maybe not a long enough growing season? I just don’t know, but it is a nice shrub even without the flowers. full sun here is okay? Summer is pretty hot. Yes, I think it will be fine in full sun — I’m in NC, Zone 7 also and mine gets full sun all day. I would just keep it watered for awhile after planting and mulch the roots. Good luck with yours. Thanks for the posting. Friend has two, fully grown, and we love them in that these keep that lovely light fragrance through most all the blooming cycle. Will be shopping for “my yard” at first opp. Thank you for commenting! They really are beautiful shrubs and I hope you’re able to find one, I’m sure you will enjoy it. I look forward to mine every spring. I also have 3 snowball bushes that have not bloomed, two of them are 4 yrs old, they leaf out, but don’t grow and don’t bloom. I have a newer one that is only 2 now and it’s not growing either. We live in North Idaho, zone 4, and I planted them in full sun. Our soil is heavy clay but they are on slopes where they will drain good and I amended the soil in the growing holes when I planted them. I mulch them with straw in the winter to keep them from freezing. Is there a fertilizer that I should use maybe that would help? Would cow manure hurt them? I’m just not sure why yours isn’t blooming. Do you prune it? They bloom on the previous years growth so I would definitely fertilize it now (compost, manure, or liquid fertilizer etc) and through the summer to stimulate a lot of growth, and don’t prune it. I’m not sure, but is it possible that it has buds that are being killed by late spring freeze? I’m sorry I can’t be of more help Barb, good luck and I hope you get some blooms on yours soon! Thanks Sherry for responding so quickly. No I have never pruned them, but you’ve given me an idea ~~ think I’ll try to lay some pieces of floating row cover over the tops to see if it could possible be the hard spring frosts. It was 20 here last night. Barb, you’re welcome, and good luck with your snowball, hope you get lots of blooms! I don’t think it would do very well if it the roots are constantly very wet. They do like semi-moist soil especially until they are established, but they need good drainage. Mine is planted just in garden soil with good drainage, I didn’t add anything special to it at all. A little peat moss would probably be good for it though, and you could try it in the spot in your yard but I’m just not sure it would do well in a very wet spot. Good luck, I hope it does well for you. Great tip about the fertilizer. Thanks Denise in Alaska. Hope your snowballs do well! Hi Sherry……..My flowers are starting to turn the brownish color because they are done blooming…Can I Start pruning now???????? Yes, right after they finish blooming is the time to prune them. Thanks Sherry for the info….. Thank you! I’m so glad you enjoyed the site and found this post helpful. I do love these old-fashioned shrubs, my mom and grandmother always grew them so they also bring back memories for me. I hope the manure works and you have an abundance of blooms on your snowballs next year. Good luck! I have the same flowers in the front of our house that we love after the first rainfall of the Summer they droop to the ground and then stay that way till we prune them in the Fall. Any ideas on how to prevent this or is there a way to tie them up? They are just so heavy. Hi Janice, with snowballs, you should prune them right after blooming in the spring. 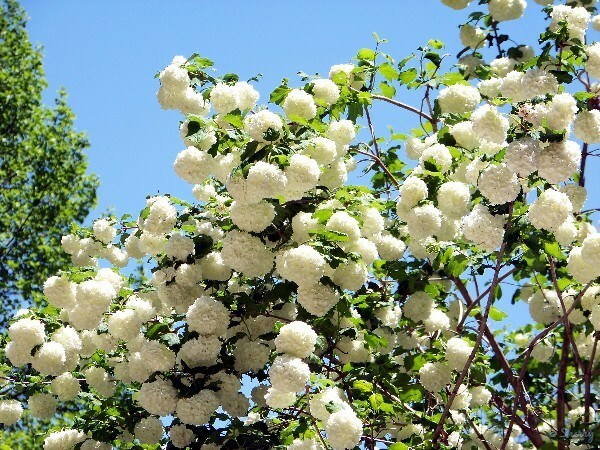 Snowballs are usually finished with their bloom by the end of May. You could be talking about hydrangeas, the shrubs that bloom throughout the spring and summer? If so, yes you should clip off the spent blooms and they will rebloom. Both types of shrubs can definitely be staked and tied. I have to use a rope and tie my snowball to the fence post when it’s in bloom or it is so heavy it will droop to the ground when it rains. Same with some of my smaller hydrangeas. I use a stake near them and then tie them to it when they are in heavy bloom. Yes, they must be hydrangeas then. They bloom in early Spring and all Summer and then turn green in the Fall and still look beautiful. My husband then cuts them down almost to the ground in the Fall so there is only wood left. They seem to grow bigger and bigger each year. They are in a flower bed in front of a window and brick wall. I guess we’ll have to drill some kind of hooks into the wall to use rope. I saw on another site recommending hoop stakes but I think you have to put these in the Spring? And I wonder how well that would hold up these very heavy flowers! Oops that didn’t register my name. That was my reply above. I have a white snowball shrub that was planted two years ago. This first year it was full of while snowballs in the Spring and was beautiful. The second year it did not have any flowers on it all and this year it did not bloom in the Spring but now in October it has buds all over it and is starting to bloom. I live in zone 7 and wonder if the plant will again produce buds and flowers in the Spring. Our first frost is due in about a week. Have you ever seen this happen before? Thanks. No, I have never heard of this before, never saw a snowball bloom at any other time other than spring. Are you sure it’s a snowball and not a hydrangea? Either way, the frost should not kill it although it might damage the open buds. My Grandmother had one in the backyard, and it was beautiful. After I had my own home, I bought a small one at a garden center in Sioux Cit Ia. It bloomed the first year, and had more than tripled its size since then. It blooms every spring, and has more blooms than the first year. Earl May has a good “Tree Start” that works wonders. We did alot of landscaping, and all the trees have done well. My bush has full sunlight, and we always water well. It has good drainage, and clay dirt. Thanks for adding the info. Sounds like yours is thriving. I miss mine! 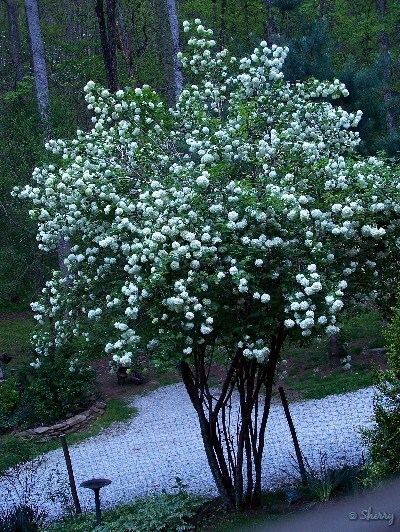 I have a couple of snowball shrubs left, but the largest one is gone (due to the severe winter and flooding we had). We bought a house in CT Z6 in 2007, after this shrub was done blooming. To my surprise in spring 2008 I had this magnificent display in my front yard. 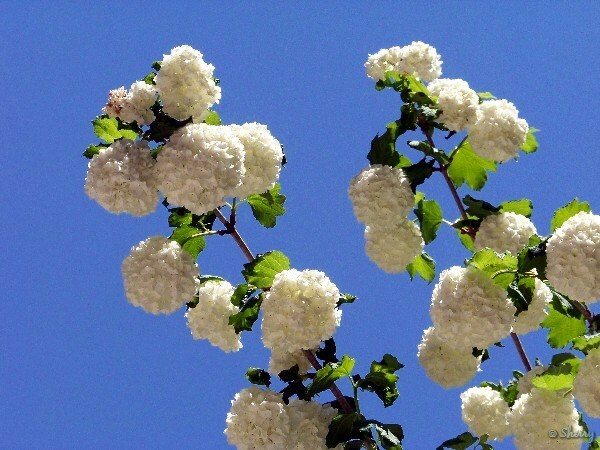 I had never seen it before and after researching found out it was a snowball viburnum. Now this one is probably like Sherry’s, probably 8′-10′ tall and probably 6′ wide and so ladened with flowers that you think it can’t possibly hold itself up. It’s gotten a bit bushy as it hasn’t been pruned obviously in many years. I’ll do that after blooming this Spring — thanks for that tip. Just to give some info, mine is in full sun on a very light slope above a rather wet area. The slope can actually get so dry the ground is dusty and dry. I’ve seen some spotting on the leaves in the height of summer and I think it’s due to the lack of water. I’ve read it likes moist soil and ours, being in the Northeast, is a bit on the acidic side so it probably likes that as well. I do nothing to this, no water, no fertilizer, no pruning (as yet) and it still blooms with abandon every spring and can’t wait for the next display in a few months. Thanks for the propogation tips, I might try that out. Your snowball sounds beautiful! Unfortunately, my largest one is no more. After an awful winter and constant flooding rains, mine uprooted a couple of months ago and broke off at the top of the ground. I think it was too top heavy and with the flooding and freezing, it was just too much for it. Good luck with yours, may you have many years to enjoy it. My mother in law has had a snowball shrub in her back yard, semi shade for the past 8 years. I is about 3-4 ft tall and is 4 stems. It has not bloomed , except the first year. She had me dig it up today to transplant in my yard. What would be it’s best chances to survive and thrive. I live in Savannah Ga. My yard has sun, sun /shade and shade. I grow mine in full sun. The largest I had got sun all day and was in average soil. Good luck, hope yours thrives. I have one of the Snowballs that have not bloomed since the first year of planting. It has grown significantly and I would like some advise about pruning – what if there are no blooms to prune ‘after’? When should the non-flowering bush be pruned? I would prune it in spring, depending on where you’re at. Right now would be a good time here because the snowballs are in bloom now so I would be pruning mine around the end of the first week in May. I’m not sure why yours hasn’t bloomed, does it get plenty of sun? 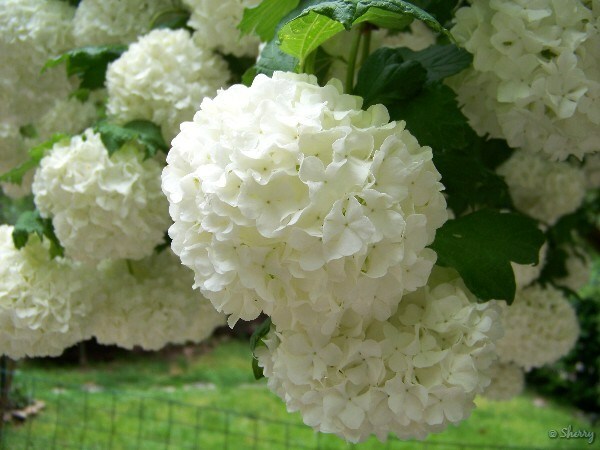 I bought a snowball virburnum April 2009. It now has its first blossoms which are white but kind of flat & not the round ball like blossoms that I thought it would have. Is this typical when it first starts blooming or do I have the wrong kind of plant? Thanks. Could that be it? Otherwise, if the blooms are not round, it could be that it’s just small? This photo is what mine looks like. However, the first year I bought it , it had little snowballs on it. The pot said it was a snowball bush. It blooms beautifully ever year, but has never had balls on it since the first year. Any suggestions,. My big snowball viburnum is literally covered in light green budballs, we’ll call them at this point. After reading how so many have problems getting theirs to blooms I was worried a bad winter would cause it not to bloom. But I am happy to report is must love the abuse Mother Nature can throw at it. I’m not if we can post a pic since I don’t own the blog or I’d show you what it looks like presently. Glad to hear that your snowball is covered in buds. If you have a pic online, you can link it here in a comment, using the img src tag and the url. If you need help doing that, send me a link to the photo and I can add it to your comment. I have five Eastern Snowball Viburnums that are used as a hedge. You can see photos at the following address (I just took these this today, 5/2/10. The blooms are beautiful, but the plants themselves are pretty scraggly looking. I’d like to end up with a plant that is shaped like yours, if that is still possible. I consider myself a novice at this stuff. How would you recommend proceeding at this point with the pruning? Specifically, where do I prune it relative to the flowers, and which branches, if any, should I remove entirely? Should I tie them up/stake them at all? 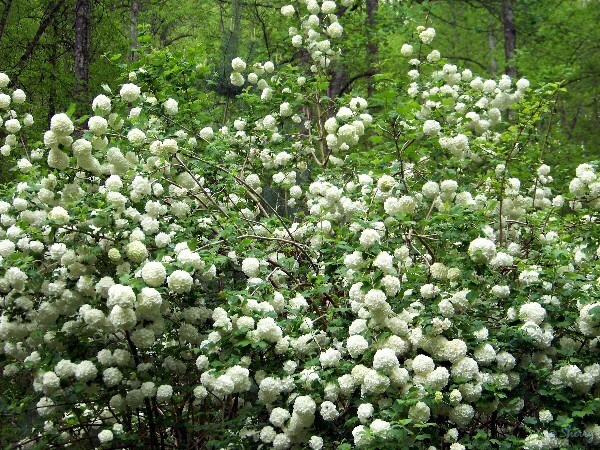 Your snowball shrubs are gorgeous! They don’t look scraggly at all to me, just heavy with blooms. I can’t see the trunks in your photos, do yours have multiple trunks coming from the ground? The way I did the snowball pictured in this post is (that shrub was very old! ), I first cut out all but a few of the thickest trunks coming out of the ground and then I cut out all the smallest and thinnest branches, leaving only the strongest limbs. Every year, right after flowering, I cut back each main stem by several inches, and again kept snipping out the smallest branches. I did this over a period of a few years until I had the “canopy” of the shrub up above my head. If you’re going to train yours into a more tree-like shrub, do it gradually and just start cutting out some of the branches each year, always waiting until right after the flowers fade. By doing it very gradually, the main trunks will increase in size each year, getting stronger, and you shouldn’t have to stake or tie them up. Good luck with yours, I think they’re very pretty the way they are. Thanks for the detailed reply, Sherry! Mine do have multiple trunks, so I will follow your directions. You’re welcome, Ben. Glad I could help. i have a question, my girlfriend loves her houseplants, and would it be at all possible to get a cutting from this snowball bush and to get it to root. i have one in my yard and she has one too. we have a very rigorous work schedule but she has time for her plants and to accomplish this is it possible? if so im going to suprise her with some smaller bushes of the same type. my poor tree will it suffer? oh and another small question her houseplants have an invasion we live in n.c. so these small ants are tiny buggers how can she get rid of them without killing her beloved plants or causing them to stunt, help us please. this site is of no help to gardeners or proper care for plantlife. the pictures are great though but the notification grade is no good. I’m sorry you didn’t find anything helpful here. This is my personal BLOG, not a commercial gardening or plant care website. My personal blog where I post my photos and other info about my life and garden. In other words, this isn’t a job, I don’t get paid for this and I’m certainly not on a schedule. I do it for my own pleasure. My posts are open for comments for those who may find something interesting here and want to comment or ask a question and I’m always happy to help when I can. I reply to every comment I see here. I hadn’t yet had TIME to answer yours above this last one you made. I would have gotten to it eventually though. Hopefully, you can find the info you’re looking for elsewhere. And in support of this particular thread, the beginning of Sherry’s post contains information of how she propogates cuttings. Read the whole post before throwing around accusations which are completely untrue. Actually, after planting some Eastern snowballs recently, we came across your blog and I left it open for days because I found it so helpful. I think it’s great and the pictures are beautiful. Thank you, Sarah. I’m glad you found this post helpful. I’m certainly no expert and can only post on what works for me in my garden, but I’m happy to help when I can. i am very sorry for typing u such a horrible message. and i mean my apology to all available on this site i read over some of it and found it very inspiring. plant lovers are really open minded over such things, my girlfriend told me to apologize. dont get me wrong i love sports. but peoples interest do count i was being rude and theres no excuse for that. but still my questions go unanswered. landon, there’s info on how I root cuttings above in this same post and comments. That’s all I know. As for the ants, they don’t harm plants but may indicate aphids. On house plants, I really don’t know. You might try posting at one of the gardenweb forums, I’m sure someone can help you there. I lightly trimmed my snowball bush just before it bloomed around the bottom and got rid of alot of dead branches as well as some regular sized green branches. This bush is about 10 to 12 feet in height and about 8 feet wide up top. will this damage the bush or will it survive? Trimming it before it blooms might cut down on the number of blooms you get for that year, but it won’t harm it at all. I prune out the dead or weak stems on mine at any time throughout the season. Snowballs are supposed to be hardy in zones 3-8, so I’m not sure about zone 9? You could always try it and see. It will definitely need some sun though in order to bloom well. You don’t -have- to have two of them. Good luck. I have two snowball viburnum at my house, both planted by the previous owner and both very happy. They bloom the week before Memorial Day here in Wisconsin and I’m loving the show right now! However, the original owner didn’t plant them in the best spot considering they’re meant to be a huge bush, they’re planted in too small of a space within a foot of my deck on two sides of a corner and therefore I’m considering trying to prune one into a tree like you show above. I’m terrified that I’ll ruin a beautiful bush but know that in another week or two when it’s done blooming is the time to do it. We’ve been here 4 years and I’ve done pretty light pruning thus far, thinned it out a bit and topped off the top in an effort to keep it a bit smaller (which I now regret since I’ll be trying for the tree shape). Any extra tips? Otherwise just wish me luck! If you’re afraid of drastic pruning all at once, why not just a little pruning the first year? Like right after they bloom, cut off all the lower limbs up from the ground and snip back the side branches just a little… then next year, maybe take off a little more here and there. Just keep doing that year by year and the trunks will get stronger and stronger. They’ll be pretty. :) Good luck! Alaine, I have no way of knowing what’s ailing your snowball. If you have had a long period of rain, that could be the problem. Since it’s newly planted, I would water it deeply once a week until it’s well established. Good luck. Hi sherry I read your site to find more on Snowball tree & then I put some cuttings in warm water for about a month then I saw a hair like root ,so I put them in soil & kept it warm .Spring here in Australia is September. I now have 2 buds about half the size of my little fingure nail.Thank U for the information on the site ,I believe U lost your big tree ,sorry to read it. That’s great! It’s so neat to propagate your own, isn’t it? Yes, unfortunately I did lose the biggest snowball — during a winter flood here it uprooted completely, along with several other trees and shrubs here. So glad you found info here that was helpful and thanks for commenting. Good luck with your garden this year and hope you have a great spring. My mother-inlaw has a Snow Ball in the garden of an old terraced house, it has been there for over 50 years. The only draw back is the beautiful blooms get smothered in black fly. Any suggestions as to why and what to do.? Wow, 50 years old? How great that it’s still there, bet it’s beautiful! Hmm, interesting about the black fly. I’ve never heard of that happening before and have never noticed them being attracted to mine. Maybe they are drawn to the nectar and don’t do any actual damage? I’m sorry but I have no idea what to do about it. Hi Sherry! Love your blog! And I’m sorry you lost your big snowball. This year mine was prettier than ever, so it was a joy. I have two questions for you. 1..Does the tub you have for propagating have drainage and how deep is it? 2.) My viburnum is in a shrub hedge and very much held up by other shrubs…I don’t even know what the form of this shrub might be by itself, or in a hedge of just snowballs…that’s what I’d like to achieve in another part of my yard. Do you think the foliage looks nice all the way to the ground, or did you prune yours like a tree (which I love) because you didn’t like its natural form? Hi Mary, thanks for your nice comments. The tub I use does have drainage holes in it, it is in dappled sun and is about a foot deep. I did prune my big snowball. I did so mostly so I could plant annuals underneath it. (It was in the middle of a long flower border in my front yard.) It was so big and so old that it was definitely more tree than shrub, I could stand underneath it! I do think the foliage is nice and looks great whether pruned or unpruned. It is Aug.10 here in Iowa and our snowball bush is blooming again for the first time this time of year since we moved here 25 years ago. What could cause this? I have a snow ball bush and for the past 2 years it has not bloomed. Is their anything I can do? I live in zone 3 and planted 5 snowballs about 3 years ago. They have grown really tall – a couple of them are 12′ +. The snowballs are beautiful, but grow only on the bottom 1/3 of the plant. How do I get them to bloom on the entire plant ? I have never pruned them, but plan to after they bloom in spring so that they will grow bushier. That’s strange that yours are only blooming on the bottom. I’m not sure what would cause that, unless somehow the top buds are getting zapped by frost in early spring? I would definitely prune it a little though after blooming, and see if that makes a difference. I have a 10 year old snowball, it blooms but the balls are not very large 3 inches maybe 4. I want to know if there is anything I can do to get larger blooms? I toy with yanking it out and buying a new one. I just don’t know! Maybe try pruning it hard right after it blooms this spring? 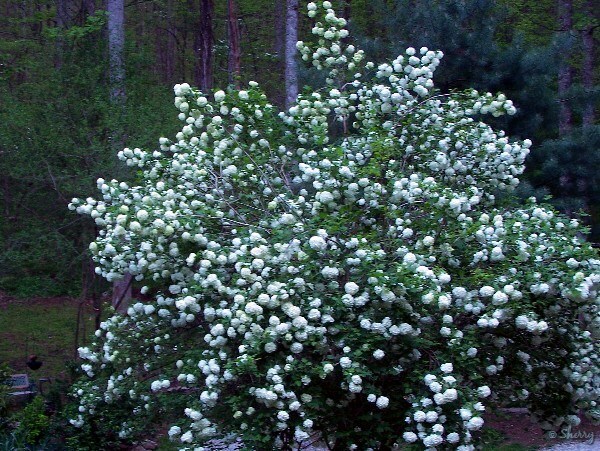 Sherry, I have 2 snowball about 8-9 yrs old and have always pruned them like a 5 trunk tree. Usually I do my “pruning” in Feb or March. Mostly in removing suckers and side leaves on the lower branches. I have always had lots of large blooms. In fact when they were green I tried thining some of them so wouldn’t have the weight, but the blooms just got bigger and still weighed the limbs down. hehe Most of the sites for pruning say to remove all trunks larger than 3 inches so I am glad you have a “tree” like snowball also. When my bush was shorter I did layering of lower branches to make additional plants. (Scrape branch a little, bury in a very shallow trench, lay a rock on it and leave until the next year.) Some branches even rooted by themselves. I now have 2 more shrubs which I want to keep small as bushes so am glad to know I need to prune right after they finish blooming. I live near Boise, Id (zone 5) Mine are in full sun with shredded bark, clay soil, auto sprinklers. Husband throws lawn fertilizer when does the lawn. Thanks so much for your comments. Your snowball sounds wonderful. I love the giant blooms, although mine do droop quite a bit, especially after a heavy rain. I love keeping it as a “tree” too. Yes, I have had aphids before in past years. I’ve used sevin as well, and also used something else once, think it was some type of insecticide soap, can’t remember exactly, but it did burn the foliage a bit, so I didn’t use that anymore. I usually just spray mine with a hard stream of water from the hose to knock the aphids back some, or as you said, the sevin dust. Helen, the only way I have ever done it is the way I described in the last paragraph of the post above. Just be sure and keep them in the shade until they’re well-rooted. Good luck with yours! Sherry, I did not know you could prune a snowball bush into a tree shape. My snowball is hugh and I don’t want to prune but just the taller limbs at the top but would love to prune into a tree shape. When should this be done? My snowball actually had about 25 blooms this summer! I was delighted! Glad to hear your snowball bloomed well this year! I planted 2 snowball bushes that I got from mail order. They were mere sticks. One of them is now a small bush with a ton of flowers. The other is barely hanging on, with no blooms, and very skimpy. The problem with the one that’s blooming, is every single bloom is lying on the ground. There’s plenty of hard wood in the center, but the limbs that hold the blooms seems too skimpy to hold them up. I wonder if they aren’t going to break off? I’m in the Winston Salem area of NC, and my plants get morning sun, but are shaded by my house in the afternoon. Is that the problem? What do I need to do at this time of the year to help my plants along? I’m also curious about growing my own snowball bushes from clippings. Wouldn’t my area be too cold this winter for me to leave them out? Sherry, I forgot to mention that the snowball bushes I ordered were suppose to be much larger than average blooms. I think it was a new variety, but I’m not sure what they are called. Also, I know nothing about gardening, so sorry to be so dumb on this subject. After my first post, I went back to read some more of the questions that were posted here, and I realized that my snowball bush blooming in September isn’t normal. Since I planted them 2 years ago, this is the first time I’ve seen a bloom. I have to wonder when would be the proper time to prune this variety? Yes, you must have hydrangeas and not snowballs, snowballs would not be blooming now. Some of the hydrangeas, especially the newer ones with the huge blooms, also have weak stems. They’ll get stronger usually as they get older. I try to put some type of support around mine, using pieces of old fencing. It helps a little. Still though, especially after a heavy rain, they are apt to sag to to the ground. Thank you, Sherry. I ordered several different plants with that order. I ordered 2 Hydrangea trees, and 2 snowball bushes. I didn’t remember that until you said I had hydrangeas. My snowball bushes (evidently) are not doing well. I have 2 small plants, that seem to be dying but then come back. They are still not much more than when I planted them. I have them in an area that has white stones, and I think it must be too hot in there for them. I think I’ll try a transplant and see if that helps. Thanks for the info! 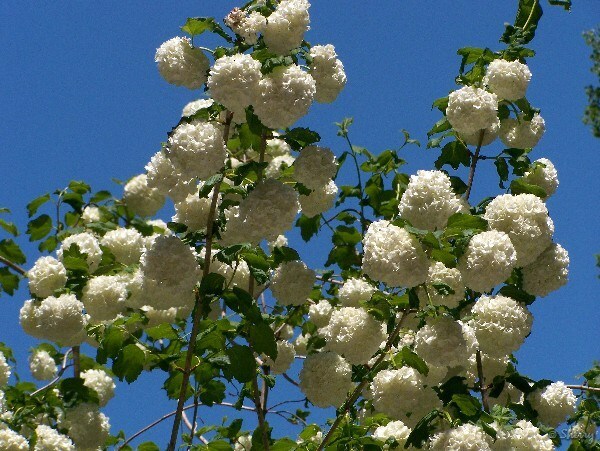 Hi Sherry – I was wondering if I could use one or two of your beautiful Viburnum snowball images on my blog (www.treediaries.com) – I will be posting this evening about three viburnum that we have just planted. If you are happy for me to use the images they will be fully attributed and linked to your site of course. Completely understand if you would rather not have them floating your work floating around on other people’s websites though! Are honey bees attracted to this snowball bush? Hi Linda, yes you can, the limbs on mine weren’t perfectly straight either. Just do it gradually, a little at a time. It took a few years to get mine more like a tree than a shrub. Hi Tim, yes, they do attract lots of bees including honey bees. Wow, that’s great that you are able to grow one well in a container! I fed my snowball shrubs maybe once a year, usually in late spring after bloom. Yours should do fine with the compost, and since it’s in a container, it wouldn’t hurt to feed it (lightly) once or twice a year. If it were mine, I would feed it once in spring right after it blooms and then in mid-summer. It helps that it is in a 20 gallon plastic container and the base is sheltered by other plants, so only the green part of the plant gets sun. What type of fertilizer would I use; a high nitrogen or something for more blooms? Thanks for your help. I use miracle-gro on my containers. Any water-soluble fertilizer would probably work as well.